It would be obtuse not to accept that as witnesses and family members of the dead begin to share their story/version of events publicly, the responding police would have a vested interest in countering any adverse aspect to the previous outline they presented. It is commonplace with officer-involved shootings to pull in another agency to conduct the investigation, but Waco PD spokesperson Patrick Swanton said that won’t happen with Sunday’s case. As a consequence there is a tremendous amount of potential for ‘responsibility shifting’ within this story. It is not a mutually exclusive argument for elements within the bike clubs to be known criminals, violent, defined as a gang, and/or unlawful. Simultaneously it is entirely possible for the police to have overreacted in response to a perceived threat. The former advocated by the police, the latter advocated by the families and friends of the club members. With 9 dead bodies, and with 18 additionally wounded, it is quite reasonable to see how the police could be concerned if the forensics indicate most, or all, of the deceased are a result of police response. Therefore, while the police should be granted the benefit of doubt – simultaneously a “grain of salt” filter should be applied liberally to shock headlines (such as above). Given the overall national tone and discussion toward excessive use of force by police agencies; the law enforcement community wants/needs the public to see their response as necessary and without alternative. Conversely, the motorcycle club community does not want the police ‘broad brush tendency’ to paint them as violent gang members. Both groups carry a vested interest. That said, as we have previously outlined, the “tone” of the narrative from law enforcement reflects their concern to be seen as the “good guys”. As the bike club version begins to surface, and directly challenges the police version, we can expect to see disagreement. However, the bike club version begins at a disadvantage because the police version is essentially embedded in the media narrative. The number of armed law enforcement officers on scene – prior to event gathering – has now increased to 22+ including: 10 Members of SWAT, 1 Asst Police Chief, 2 Sargent’s and 1 rookie officer, from Waco PD; the rest from Waco County and Texas DPS. ◾Jesus Delgado Rodriguez, 65, died of gunshot wounds of the head and trunk. ◾Jacob Lee Rhyne, 39, died of gunshot wounds to the neck. ◾Richard Vincent Kirshner, Jr., 47, died of gunshot wounds but the report did not specify where he was shot. ◾Richard Matthew Jordan, III, 31, died of gunshot wounds to the head. ◾Wayne Lee Campbell, 43, died of gunshot wounds to the head and trunk. ◾Daniel Raymond Boyett, 44, died of gunshot wounds to the head. ◾Manuel Issac Rodriguez, 40, died of gunshot wounds but the report did not specify where he was shot. ◾And Charles Wayne Russell, 46, died of gunshot wounds to the chest. Eight of the deceased are claimed to be members of the “Cossacks” club. One of the dead is claimed to be a “Bandido” member. Nothing more, nothing less. Nothing indicates a “fight in the bathroom”. Most witness explanations now center around the initial impetus for the confrontation was caused by the arrival of the Cossacks Club who were not anticipated to attend. It appears they are using two different size markers. The larger markers are on the edge of the scene and smaller markers are on the parking lot. Some of those evidence markers should be identifying shell casings. “.. […] I don’t believe the Waco Swat Team was involved in the shooting itself, but had arrived at the end of the shooting. My suspicion is that the actual shootout involved uniformed officers who were stationed close by monitoring the event and not the swat team. 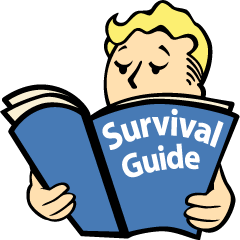 I believe the swat team and their armored vehicle may have been staged nearby, out of sight so as not to alarm regular citizens who were at the mall shopping or eating lunch. It would have been bad for business to have the armored vehicle and swat officers in full kit running around in plain view. The few photos I’ve seen of the armored vehicle’s placement at the scene tends to back up my belief. It also appears that the swat team provided over watch during the crime scene investigation. I believe the arrival of the armored vehicle and additional officers may have been what ended the violence. We should also remember that this incident was an “all hands of on deck” kind of incident. I suspect numerous off-duty officers responded to the scene to help. Some were at the mall others responded from home. The bearded officer wearing the body armor and carrying the AR-15 was probably one such officer. I can not see an “agent provocateur” remaining on the scene to be photographed. It makes no sense. I see at least three AK variants and what appears to be two AR-15 on the table. It would appear that at least some of the bikers came ready for trouble. I do not believe that the weapons that may have been used by the bikers that had been shot, would have been in that display. Those weapons are evidence and would have been handled as such. FWIW Back in the day, biker gangs would have vans or pickup trucks following them on runs. Some of the support vehicles were for hauling broken down bikes, others were for carrying the gangs heavy weapons”. One of the men arrested in the aftermath of a motorcycle gang shootout in Central Texas that left nine dead is a retired San Antonio police detective. Lewis was among about 170 people arrested in Waco and charged with engaging in organized crime. This entry was posted in Abusive Cops, Agitprop, Death Threats, media bias, Police action, Waco - Twin Peaks. Bookmark the permalink. From “over 100 guns” revised to “around 50 weapons” and now over 300 weapons?!?! I think they’re counting kitchen knives and the silverware inside the restaurant. I have seen pictures that clearly show a number of rifles. The count you are citing is before they finished counting. Would be interesting to know how many of the guns were actually were in cars instead of on somebody.. I got to say I found that laughable. With the first 3 officers bursting through the doors, according to reports, within 3 seconds of the first shots, one would have to believe that the bikers were all psychic and knew in advance the shooting was about to go down, to have enough time to stash all the ‘gear’ away. The bikers could see the police when they rolled up and you know they were announcing the PD’s arrival inside & out. They had plenty of time to hide them inside. I would be interested in seeing the restaurant video inside and outside (if they had outside cameras. Everything seems to be speculation so far, kind of like Michael Brown & Freddie Gray. Again, that’s only true assuming the bikers anticipated the police assault on the restaurant and the following arrests. Otherwise, what reason would they have to worry about being stopped, searched and found armed? How would that be any different from them riding the bikes with the guns/weapons on their persons? I know there were some comments about the guns being potentially illegally carried inside, if that Twin Peaks was a 51% restaurant. But according to everything I’ve found, that place had no 51% license. Thus the guns would have been lawfully carried inside (absent any person-specific criminal convictions and similar legal prohibitions). I agree that having the CCTV tapes released publicly would be the best thing for the pursuit of truth. I would put money on it all killings or most came from the gang in uniforms with badges. They kill over 1,000 people a year. I don’t see no motorcycle club killing that many people. Apparently the non SWAT cops were using rifles too, most of the 9 killed were head and neck shots, shooting fish in a barrel. That was my first thought, too, when I read the list of injuries of all the deceased. Head/neck shots are almost a trademark of a highly skilled tac unit. A deer rifle, a couple of single stack AK’s, a MOISIN NAGANT, an air rifle………..I can’t see carrying some of these on a bike. The pump 12 guage is missing the rear stock, and it has a full length barrel. Think they cleared the crap out of the evidence locker to make an impressive photo. How would the leather vest, wooden tray, and plaque be used as weapons? They are showing them off b/c they say “Bandidos” on them and the Bandidos are considered an outlaw 1%’er MC. That photo of weapons and “trophies” Was photographed by the San Antonio P.D. and has no direct link to Waco . Just look at the blue table cover. 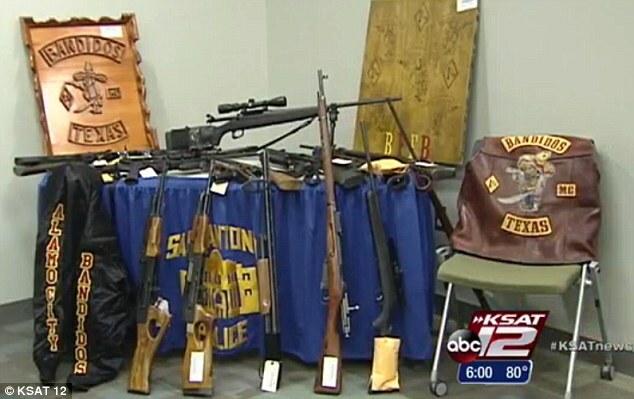 The Photo of “weapons and trophies” Is from the San Antonio P.D. How is it related to Waco ? Just look at the table cover. Nearly 72 hours after a shootout erupted at Twin Peaks, killing nine people and injuring another 18, officials have found 318 weapons tucked into kitchen areas, vehicles and toilets — a lower estimate than was released early Wednesday morning. Waco police Sgt. W. Patrick Swanton initially said that number reached up to 1,000, police later revised that number downward and Swanton said officials have only actually counted 118 handguns, 1 AK-47 and 157 knives. Not counted are the batons, brass knuckles and chains, and Swanton said he still expects the number of weapons to rise. Wow. I missed the “1000” weapons claim. Their reported estimates have now ranged from 50-1000. Don’t they have anybody that can run a spreadsheet? .1. Most, if not all of the weapons could be legal. If you travel on the road it’s only smart to have protection. .2. Chains….may be deceptive… The chains may not be the big chains used to haul stuff. Bikers and other folks have wallets with a small gauge chain attached to deter criminals from stealing the wallet. Oops. How can I delete duplicate comments? If we are searching for truth w/ no agenda it’s probably a good idea to put “bikers ducking for cover” into context. “Security camera video reviewed by The Associated Press shows that as gunfire broke out in the parking lot of a Texas restaurant, dozens of bikers ran for cover inside and tried to guide others to safety. The video suggests the Sunday gunfight that left nine dead was contained almost entirely outside the restaurant, besides one gunshot fired by a biker on the patio who then runs inside. On the patio, bikers are seen ducking under the tables and trying to run inside. At least three people were seen holding handguns. One biker is seen running with blood on his face, hands and torso. The gunfire took place outside on the patio or in the parking lot (confirms what we know). At 3 people were seen holding handguns. One biker is seen firing a shot (ends the cops were the only shooters claims). A website widely read by bikers called “The Aging Rebel” has published an alternative account of what happened during Sunday’s bloody shootout in Waco, Texas. The article titled The Waco Police Massacre brings out a number of details not previously published and also presents the controversial theory that event was essentially a police ambush. I hope somebody here makes a copy of this article somehow. Seriously, though, I just find it amazing in this day and age that no one held their smart phone overhead and hit “record” while things were going down outside. The other thing that just blows me away is that, with all the dead and injured and all the bullets the bikers were supposedly firing, the only people hit by bullets were bikers. No one else. How is that even possible? It’s likely or at least very possible that all the bikers’ phones are in custody of the police. It sounds like others around were too busy taking cover to think about recording. There is no doubt video of all that went down from security cameras as well as phones. AP has video from the restaurant but is not releasing it. I just now read that. Security camera video reviewed by The Associated Press shows that as gunfire broke out in the parking lot of a Texas restaurant, dozens of bikers ran for cover inside and tried to guide others to safety. The AP was shown the video by representatives of the Twin Peaks restaurant franchise. They have not released the video, citing the ongoing police investigation. A bar full of bikers fighting in close proximity to one another would account for all the injured being bikers…. The Cossacks were the group that accounted for 8 or the 9 killed. They are also the uninvited group that allegedly pulled up and started this fight in the parking lot/patio area of the bar, leaving themselves very exposed to gunfire- either from the bar/patio; from the parking lot; or as a result of being in the middle of any crossfire. Only something I saw (and some attendant speculation). May be important; may not be. Relevant to the discussion; yes. Nothing like this has ever happened at the huge rally in Sturgis. In South Dakota you can conceal carry with no permit or license required. You can even legally buy silencers with no license or special permission, for use in-state only. The Bandidos and Cossacks rivalry in North Texas has been about to boil over for months- there have been at least two major instances of Bandidos assaulting Cossacks and Cossacks assaulting Bandidos in the last 6-8 weeks. Something big was going to happen b/w these groups; it was really only a question of “when” as was pointed out in a May 1, 2015 Texas law enforcement bulletin. I’ve never been to Sturgis, but I did hear today that there always stabbings at Sturgis, but that it’s isolated incidents and not widely reported. I’ve not heard of the Rangers being involved. Don’t know what the criteria are for their becoming involved but this was not a local spat. The way I understand Texas law, you can keep every weapon you own in your car quite legally. I’d like to know where all of these weapons were located as I have a suspicion that a fair percentage would be in cars. From what I understand, except for school students many Texans still have the gun rack in the in the pickup with rifles in it. Johnny Snyder, vice president of the Boozefighters Motorcycle Club in Waco, said some people licensed to carry had firearms in their vehicles when they arrived but didn’t bring them into the restaurant Sunday where the shootout occurred. The other thing that puzzles me is that we haven’t seen any interviews of any of the “scantilly clad” waitresses at Twin Peaks. (The press seems to enjoy mentioning that there were “scantilly clad” waitresses at this particular joint.) Surely, someone besides the cops saw something relevant. I’ve only seen one supposed “eye witness” interview of a woman who was hiding inside the restaurant. But they didn’t ask her anything about what she saw or where it was going on. What gives. Did no one (who wasn’t arrested) see anything? Two were interviewed by yahoo news and described fighting and shooting in the bar. Someone posted a link to it in the previous article. CNN for what it’s worth is reporting on TV that there were more than 1,000 weapons. I guess we will see. Apparently in bags of chips and flour? Weird. Thank you all for your kind words. Jake was the one in a pale yellow sleeveless tshirt, lying on the bed of a truck, being given CPR by his friends, in some media pictures. He had been sitting, after lunch, talking with his friends, when he heard a scuffle start. He walked about 40ft, just around a corner, to see what the skirmish was about, and that’s when he was shot in the neck and killed. He had no gun. He had never owned a gun. He hated guns. He had no criminal record. He’d had the same job for almost 20 years. And he hated drugs (but he did love beer). It’s killing me to see all these guys painted as violent criminals and losers. That just isn’t the case. But…. I’ve seen several people on tv who belong/have belonged to MC clubs (not necessarily these clubs) and they all said that half the members are regular people, and half deal with crime (selling drugs, assault, etc). Personally, I wouldn’t belong to a club that had any sizable percentage of criminals in it. For all kinds of reasons. That was my comment. To the person who asked why anyone would join a group that was involved in criminal activity, this is what his family would like you to know: He had always lived in a town of 1000 people. He was probably bored. And the sheriff of his town, as well as the sheriff of his county, has said publicly that they’ve never had any issues with their motorcycle clubs. He joined a tiny chapter to hang out with his friends and ride bikes, and that chapter was not involved in criminal activity of any kind. We aren’t sure how they wound up going to Waco for the meeting, but we are quite sure it wasn’t to start trouble. Jake didn’t have a gun, and he was the primary custodian of his children. He was an excellent father; attended all school functions and coached baseball. There is no chance he would take that kind of risk with his life, because it would destroy his children. And it has. I hope some high powered attorney/s try to get to the bottom of this. Ok, something WAS gong to happen between two MC gangs so the police made it happen. Now 170 people are being charged with “organized crime’ but what is the crime? Am I close? Did I miss something? Did I win the prize? I read that the Twin Peaks lost their franchise due to prior warnings of the five gangs meeting there and possible rioting. A simple observation — American Police routinely record Leatherman type multi-tools as “knives”. If you have to adjust and tweek a cranky motorcycle, a high end multi-tool is a requirement as there is no trunk on a motorcycle for a full took kit. Chains and combination locks to secure the motorcycle are not a tell criminal tell either. That you have a lot of arrested motorcycle riders tagged as “carrying knives and chains” does not say much more than the arrested riders have valuable, high maintenance, motorcycles. The 1% colors and firearms are the tell, not knives or chains. The photo of “confiscated weapons” is NOT FROM WACO! It is an old file photo from a San Antonio police raid on Banditos quite some time ago! It conveniently creates the desired illusion that Banditos formed 90% of those attending Twin Peaks. Yet another falsehood planted by Feds and organized LEs. There were mostly Cossacks in the TP photos. This is what is NOT being said and should be a large part of the investigation/justification to calm the public view of the WPD. All those officers were mere yards from the shooting, how many took any kind of hit to their body armor? Some lawyer should immediately demand all the clothing and body armor and duty weapons be impounded by the Federal Government to protect the evidence after filing a criminal complaint against the WPD. Every officer that came to the scene should have made a statement that included their time of arrival, what they witnessed, when they drew their weapon and how many rounds they fired. Ballistics on every gun at the scene should have been gathered and any unaccounted for weapons documented ( meaning a ballistics examination on a bullet can’t be matched/documented to one of the weapons found on the scene or used by the police). The spokesman said the bikers shot at the officers and they then returned fire but who was shot at, how many bullet strikes were found on buildings, cars, and other structures? How many empty casings were found that did not match Police armament. Who released the picture of the weapons, I noticed the KSAT emblem on the picture, that is a San Antonio TV station and I see the table cover is from SAPD as well. Has anyone done a Freedom of Information request for the autopsy results? So it seems to me that there is a large piece of the puzzle that the police have not filled in. Who did the autopsies, was there any independent professional present during the gathering of that evidence. Was their video with sound recordings made of the actual autopsy and are those bodies being held as of yet for independent verification of the results. Who did the ballistics? If Waco’s own lab did the tests they should be verified by the FBI. Don’t fall for the “ongoing investigation” statement because WPD has already blown that out of the water with data they have released thus far.